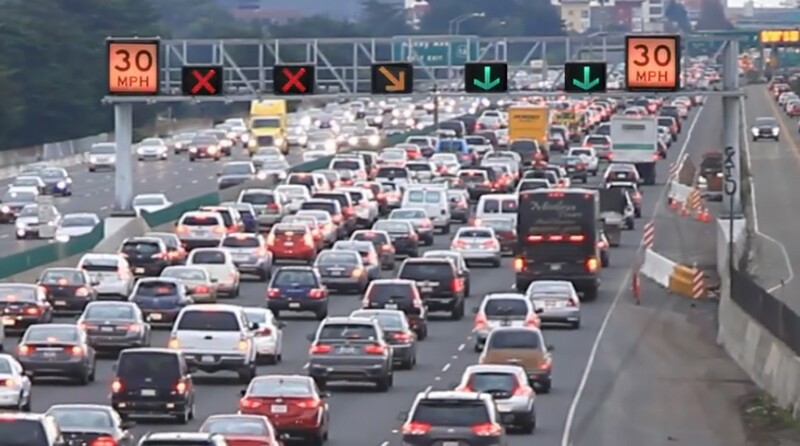 Can Technology Make a Dent in East Bay Traffic? Here’s one unwelcome sign of the Bay Area’s resurgent economy: slower commutes. A study out last year found that in 2013, the amount of time wasted sitting in traffic rose 10 percent in San Francisco and San Jose. The tech boom may be partly to blame, but technology could also help ease some of the congestion. A project called the "I-80 SMART Corridor” is set to test the idea this summer in the East Bay. It’s on a notorious stretch of freeway -- ranked the area’s worst for commuters nine of the last ten years -- running from the Carquinez Bridge down through Richmond and Berkeley to the Bay Bridge Toll Plaza. This is the kind of commute that wears on people. After a typical workday and another long drive back, Farr would arrive home stressed – “tightly wound,” she says – and eventually her family nudged her to start catching the train to work instead. Riding in with her that morning, Farr and I free-associated about amphibious vs. flying cars as means of cutting directly across the Bay. It might sound nutty, but so too does the prohibitive cost of adding another lane to this stretch of freeway -- roughly a billion dollars -- were that even possible. At a paltry $80 million it’s a relative steal, funded through a mixture of federal dollars and various agencies, including Caltrans and local transportation agencies in Alameda and Contra Costa counties. If you then exit to go around the congestion – as drivers often do via San Pablo Avenue, which roughly parallels I-80 – signs will let you know when you’ve made it past the freeway congestion and should get back on. To keep your merge from disrupting the freeway’s flow, “ramp metering” lights will cue you to get back on at just the right moment. Orchestrating all of this will be moment-by-moment data, gathered from thousands of sensors -- metal loops embedded in the road that detect how many cars are traveling in a given lane, and how fast -- which is then processed by a computer algorithm. 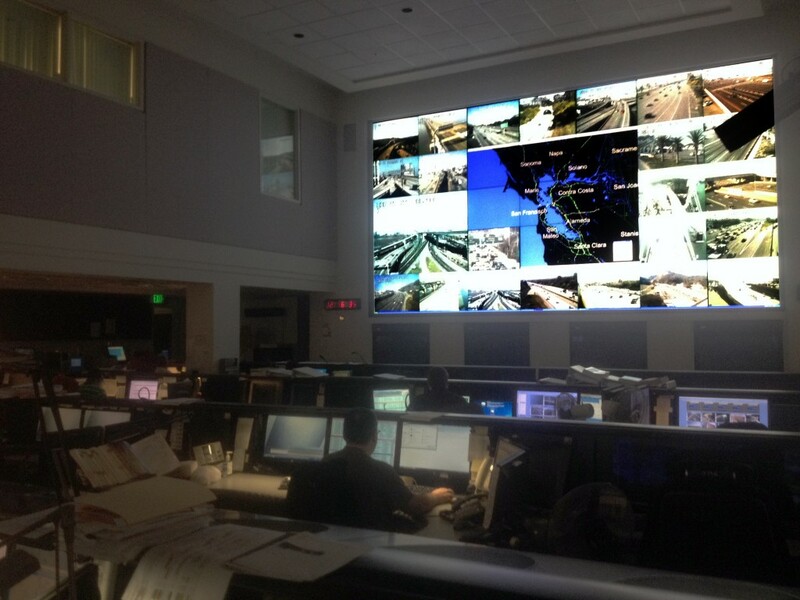 In a dimly lit room in downtown Oakland, the many thousands of drivers traversing the Bay Area’s freeways are monitored not just by computers but also humans; it's CalTrans' version of Mission Control. Every workstation features several monitors and faces a large array of screens mapping the conditions of various highways, as well as closed-circuit TV monitors: car fire on one screen, impossible view from high atop the Bay Bridge on another, etc. Nozzari is careful to say that nothing from these cameras is recorded. They’re not for police or resolving liability disputes (though people ask) but rather to give workers here at the Bay Area Traffic Management Center more detail about specific situations: in dealing with a crash,for instance, they need to see exactly which lanes are blocked. Nozzari is also careful to say that when the SMART Corridor comes online in a few months, computers won’t be running the show. The algorithm will quickly distill a huge amount of data, but human operators will make the final call about what information goes out to electronic signs on the freeway. “We always need a reality check with what maybe an artificial intelligence system tells us,” Nozzari says. But How Much Will it Help? 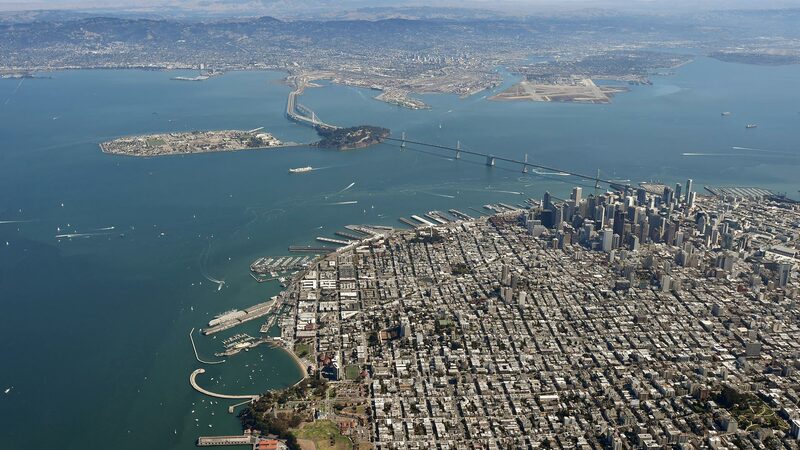 If it proves itself, the SMART Corridor could become a model for widespread use around the Bay Area. Many of its technologies have been used elsewhere, but combining them all into one system on this scale is a first-of-its-kind endeavor. The benefits from all this remain “undemonstrated,” according to Alexander Skabardonis, an engineering professor at UC Berkeley and expert on all things traffic. Freeways in the Seattle area have been experimenting with some of the same technologies. Engineers say their system has made a dent in travel times, saving commuters three to 16 minutes on I-405 in Renton, for example. But the major payoff has more likely been in safety. “I’m sure that we are saving lives out there,” says Washington state traffic engineer Morgan Balogh.